Settle down and get ready for a review beaming with compliments and excitement for these 2 products! I do talk ALOT about stuff I'm loving and how great things are but I can hands down say these are some of the best haircare products I have used for years! Neal & Wolf are a company that I hadn't even heard of until recently (where on earth have I been?) A professional range including both haircare and hair styling products, these are said to be the ultimate combination of clever science and perfect glamour. 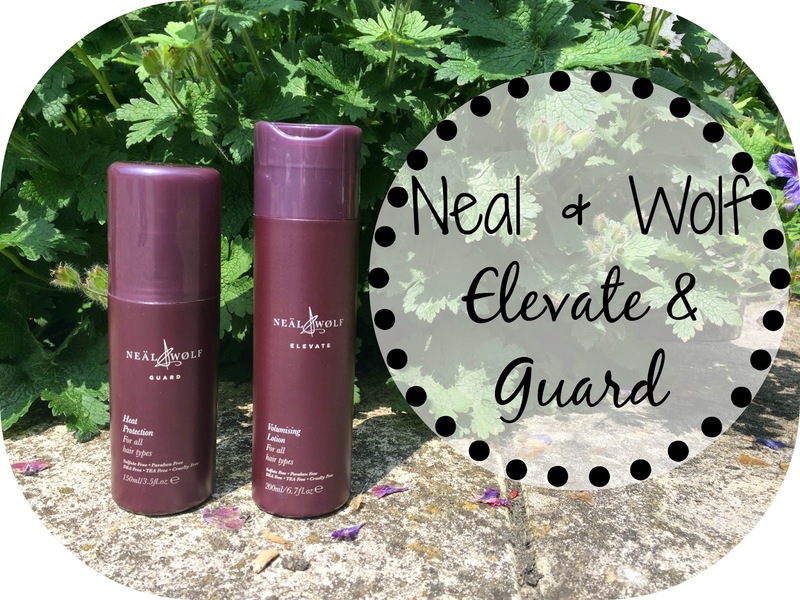 The products I have been using for the last few weeks are the Elevate Volumising Lotion and the Guard Heat Protection. Before I say anything about these two I just have to say... they smell incredible - like you're sat in a salon, I'm so so happy I've found them! Elevate is a volumising lotion which helps you to "wave goodbye to drap, limp locks" and give your hair a fabulous bit of oomph, creating a thick and healthy look! I haven't used alot of products like this before, I normally stick to wash out volumising products like shampoo and conditioners! I was a bit dubious at first, I didn't want to clog my hair up with endless products and have it feeling sticky and well... pants BUT ..... there was NO need for me to feel this way! I cannot explain how amazing this made my hair feel, it is just like a leave in conditioner (but thicker) - the first time I used it I literally couldn't stop running my fingers through my hair! For the full effect you're meant to then use a hairdryer and a nice big brush to get the extent of the fab volumising power. I've done this a couple of times and it works a charm but most of the time I'm in a rush for work so I let my hair dry naturally and I still feel like it works great! My hair has felt so soft, less frizzy and when putting my hair up and styling it I've definitely noticed that it is looking and feeling alot thicker and fuller. Elevate is £12.50 and I will be 100% repurchasing when I have run out of this bottle. Throwing it out there - this is my favourite hair product at the moment. Next we have Guard - a heat protection spray. Again this has the amazing Neal & Wolf signature scent which I have become slightly addicted too - I swear I've smelt it somewhere before but no idea where! This is a lovely lightweight mist which I have been using on both wet hair before I dry it and dry hair before styling. Guard protects agaisnt heat up to 22o°c and as has a special film-foring polymer which "guards" (ence the name) the hair cuticles from lossing moisture during the styling process. Alot of the time my hair can feel brittle and dry after straightening, curling or blow-drying but Guard has really made a difference, my locks still feels soft after styling which makes me feel less guilty about using heat on my hair (we all know I don't do it that often, once or twice a week) and having a healthy shine is always a winner too! Guard is £11.50 for 150ml and usage would obviously depend on how much you use heat on your locks, for me this will last a good long while as I'm not an over-user of tools! Both these products are sulphate and paraben free - something which hadn't really bothered me before but I have recently taken a big interest in and my hair is feeling great! Yes this has been a glowing review but these products, in my opinion, are absolutely fantastic, I am so so grateful and happy that they've been bought into my life - I need the rest of the range asap! Ah Neal and wolf products smell amazing, these sound fab! I've never heard of this brand before but so glad you've introduced me, these products sound great!